I was thinking of pulling the heater unit out for an overhaul, re-foam, lube, etc and given it’s nearly summer again here , thought I’d keep the car going by connecting the coolant inlet and outlet hoses from the engine directly and just keep driving her. Are the hose ends the same or different and has anyone some tips please on how they approached it. 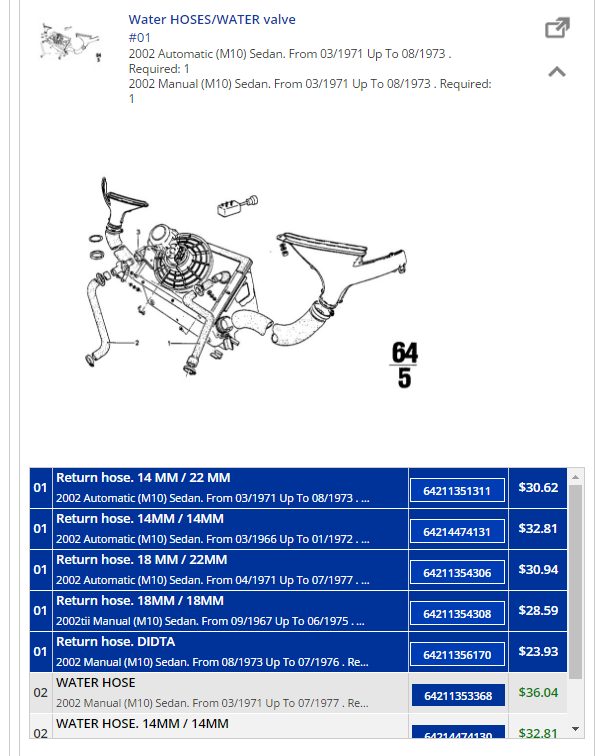 The parts required and remove/overhaul/reinstall I can see are well covered in a range of articles. I am pretty sure they are 1/2" interior diameter (i/d). 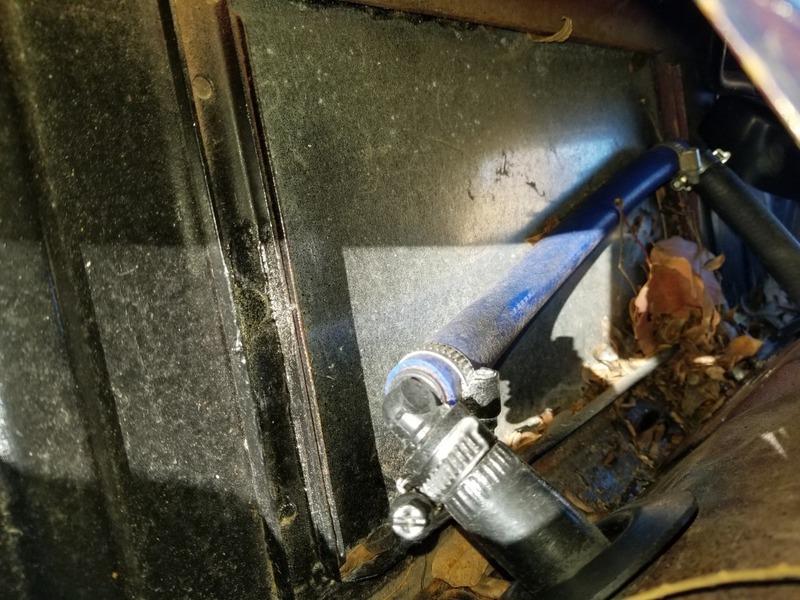 Problem will be bending the new rubber heater hose to connect across where the heater box sits. I think about. 2 feet of 1/2" id heater hose will be enough to create enough arch but you will need 2 short pieces of 1/2" copper pipe to join everything together and maybe a couple of extra clamps. I am assuming you have a non A/C car. If you will use the original hoses from the head and the intake manifold, you'll need to know the size of the intake and outlet hose connections on the heater box. Parts manual has sizes of both ends of those hoses. After you figure out the hose size, get a couple of nylon elbows to go in the heater hoses and a length of hose to go between the elbows. Then, Bob's your uncle! This might warrant a bit more research. I have a vague recollection that connecting the outlet directly to the inlet is a bad idea as it then dumps hot water (without the benefit of cooling across the heater matrix) directly on the back of the water pump where the system ‘expects’ cooler water. This can cause problems with circulation and heat soak. If you think about it, the system includes a valve to shut off the coolant from the heater matrix and therefore there shouldn’t be any issues with just temporarily blocking the heater hoses. Search around on here, there are a number of positions stated on this issue. I thought track cars all deleted their heaters ? Doesn’t it skip the heater matrix when the valve itself is closed? Sorry - dumb question - further looking at some heater box images on the web it's clear that the valve is a simple two way arrangement. So presumably the heated water just flows around to the engine again if the valve is closed ...? My heater box leaks into the cabin. Like Simeon, I read connecting the 2 was bad. I tried it and got high temp readings so I didn't drive with it connected. So I ended up just plugging both hose ends and now the car runs nice and cool no matter how hard I run. So i assume that water galleries just take the flow (via a coolant circuit) once the heated water tries to exit the head to the heater box and "finds" the valve closed. Out of curiosity, what did you plug the hoses with ... suitable sized bolts with clamps? So i assume that water galleries just take the flow (via a coolant circuit) once the heated water tries to exit the head to the heater box and "finds" the valve closed. Out of curiosity, what did you plug then hoses with ... suitable sized bolts with clamps? I just had them clamped closed for a little while with small lock pliers to stop flow during my testing but found some solid metal rods to fashion a "plug" and hose clamped it in place. I've yet to pull the heater box out bc of laziness. Now that it's colder, I may reconsider. I'm no 02 guru but I've not run into any probs yet with it setup like this. Been a couple months now. Yes, most of them. Heater circuit plugged. I just brought the hose to home depot and found the right plug size. Yeah i think i would block it as well. When the heater box is installed and turn off, water does not flow through the heater valve so i would emulate that setup with the heater box removed. The heater valve just shuts off the water flow through the heater core when closed. You don't want to connect the 2 hoses as Simeon said it will run hot water from the back of the head right back into the water pump without going through the radiator. Just block both hoses off while your heater is out of the car and it will work just fine. Yes we do remove the heaters in the race cars, and we block off the ports on the heads and water pumps. why not just rebuild the heater box in a weekend if the parts are all in hand? No reason why you need to bypass anything for a few months. I live in Florida . I plan to eliminate the entire heater.